A heart attack, or myocardial infarction to give it the proper name, is still a very common cause of death in the UK. Those unfortunate patients with severe heart attacks don’t even touch the ground, going straight to the cardiology department to have the offending blood clot removed from their coronary artery. In the medical admissions unit we also see a lot of patients with chest pain who have less severe heart attacks. he said, at the same time also knowing that this was not the case. Of course she did the sensible thing and called the ambulance. When the ambulance men arrived they gave him morphine, oxygen, nitroglycerine and some aspirin tablets to chew. They did an EGC and sent the result to our ED department – not normal but not a major heart attack. When he arrived we measured the level of troponin (a substance that indicates heart muscle damage) in his blood – it was increased to over 200 – the normal upper limit in our hospital is less than 14. He had an NSTEMI, that is a non-ST elevation myocardial infarction. That meant the damage was probably caused by a partial rather than complete blockage of his coronary artery. What causes the pain with heart attacks? When a coronary artery is blocked, or partially blocked, the bit of heart muscle it normally supplies gets starved of oxygen. It needs oxygen to make energy in the form of ATP to keep on beating. In the hope that oxygen will be soon restored, the cardiac cells take out a pay-day loan. The cells that have spent all their oxygen convert glucose into lactic acid to produce four ATP molecules. Normally, when oxygen is available a glucose molecule produces about 30 molecules of ATP. Lactic acid produced in the abscence of oxygen lowers the pH (more acid) and stimulates sensory nerve cells – this is perceived as pain. Bad pain. Visceral pain. The sort that makes you vomit and makes think you are going to die. Payday loans are always costly. About half of the patients with full-thickness STEMIs who die, do so before they get to hospital. This is mainly because the lack of oxygen and metabolic upset caused by the blocked coronary artery causes ventricular fibrillation – a fast and totally chaotic electrical activity which results in no useful heart function and death in a few minutes if not terminated by an electric shock. So why did Toby get a blocked coronary artery? Sorry, I now realise this is going to be a longer blog than usual. I think it is useful to know that traditionally, the Japanese suffer from far less coronary artery disease than those in the US or northern Europe. By far less I mean about 30%. This is a huge difference. 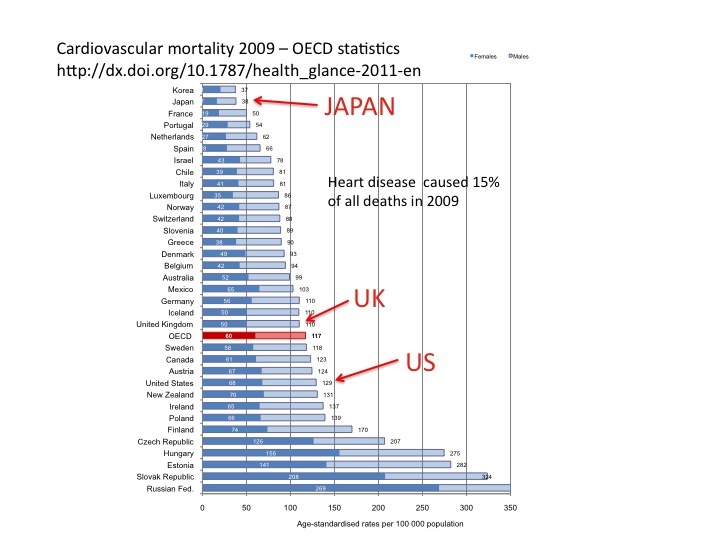 If we were like the Japanese we could dramatically reduce the number of patients admitted with coronary artery disease and probably reduce our cardiac department costs by over a half. There is plenty of evidence that it is what the Japanese eat which protects them from coronary heart disease. The traditional Japanese diet has a lot of fish and vegetables. When they move to the US and eat hamburgers, fries, cookies, and donuts their rate of coronary heart disease soon matches the rest of the US population. What is also interesting is that those in Southern Europe eating a “Mediterranean diet” tend to have much lower rates of heart disease than in Northern Europe (although not as low as Japan). Their diet also has quite a bit of fish, but also has a lot of olive oil, pasta, and bread. I think what we do know is that saturated fats are quite bad, trans- fats are very bad, and fish is good. What follows is an attempt to explain why, with a mix of accepted orthodoxy and some speculation. If you think my speculation is way out of line I hope you will tell me. The traditional Northern European diet relies heavily on wheat, with supplementation by milk and dairy products, particularly in the winter. Northern Europeans have a mutation which means that they can drink large amounts of milk as adults. Infants, of course, can drink milk, but to be able to absorb the milk sugar lactose they need the enzyme lactase to break the disaccharide into glucose and galactose. This enzyme is conveniently situated in babies on the surface of intestinal cells. For most of the world’s population, the lactase enzyme disappears at age 2 or 3, meaning that if they drink more than a cup full of fresh milk they will get diarrhoea. The lactose is not absorbed but goes to feed bacteria in the colon who have a party. Normally these bacteria see only the leftovers from our diet such as cellulose fibre. The result of the celebrations is a lot of gas, abdominal cramps and diarrhoea, otherwise known as lactose intolerance (not to be confused with milk allergy). The ability to drink milk without these problems as an adult is known as lactase persistence. This mutation has allowed humans to colonise Northern Europe and survive in the Winter by drinking milk, and more recently eating dairy products. This is a link to a fascinating blog post all about lactase persistence and a map showing which adults in the world can drink milk, and those who can’t. The wheat we traditionally grow in Northern Europe is not good for making bread. It does not have enough of the springy gluten protein to allow large bubbles to form in the rising dough. The bread turns out heavy and unappetising. Having said that, it was the staple food of most people in the UK until relatively recently. 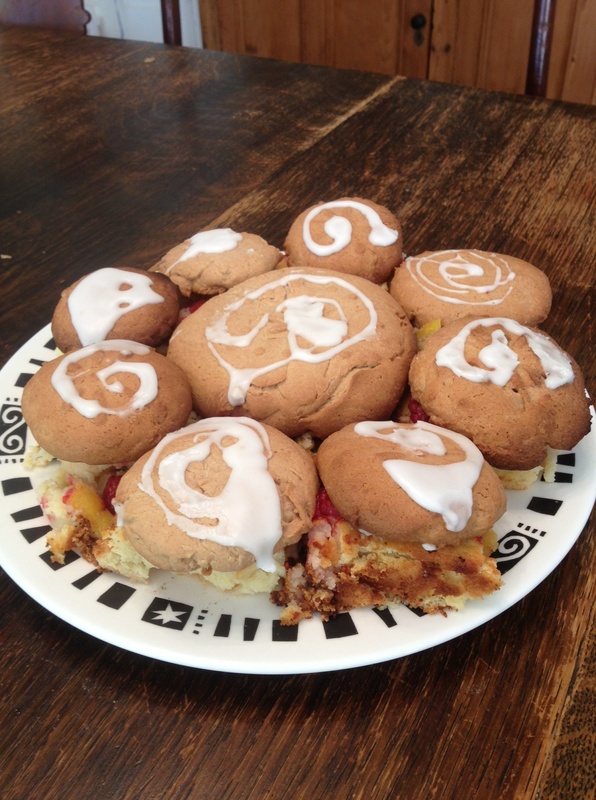 What English flour is really good for is making pastry and biscuits (cookies). For that you need low gluten (weak) flour and hard fat, such as butter or lard – or indeed, suet. Butter has always been plentiful in England because of the huge dairy industry – turning milk into butter preserves most of the calories and stops it spoiling so quickly. The problem is that butter contains mostly saturated fat. You can generally tell how saturated a fat is by how hard it is at room temperature. Butter is slightly more saturated than lard, but less saturated than suet, the fat surrounding kidneys. Olive oil is monounsaturated – it is normally liquid but will solidify in the refrigerator. Sunflower oil is polyunsaturated – it will stay liquid even when quite cold. You will see that it is made of three long chains of carbon molecules, joined onto a backbone of glycerol – a 3 carbon molecule. Why is all fat in nature stored with this arrangement? Why not a backbone of 2 carbons, or 4 or 20? I don’t know. Answers please. The reason why saturated fat is solid at room temperatures is because the long fat chains are straight. 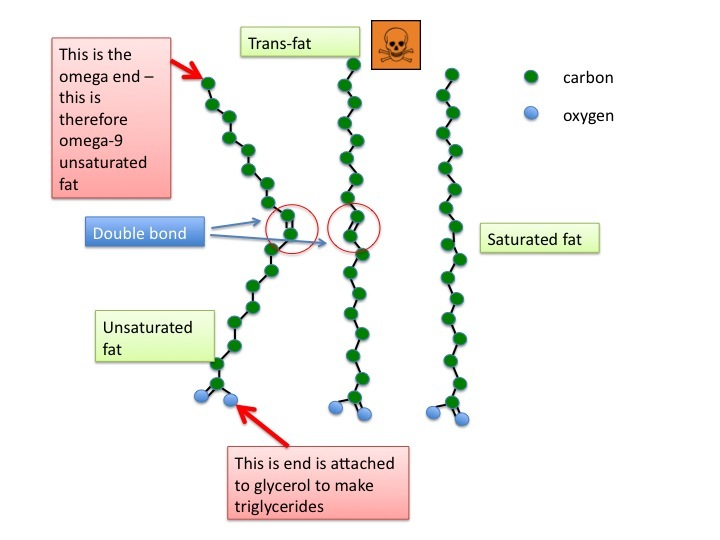 Unsaturated fats have a double bond C=C somewhere in them which makes the chain bent. Bent chains don’t line up next to each other so well, and are more reluctant therefore to solidify and stay liquid at lower temperatures than saturated fats with the same length of carbon chains. Saturated fats come mainly from mammals. Unsaturated fats come from plants and fish. There is a reason for this. Plants have to endure cold temperatures. Fish live in cold water and are poikilothermic – their bodies are a similar temperature to the water. Mammals stay warm, with a core temperature of 37 degrees. 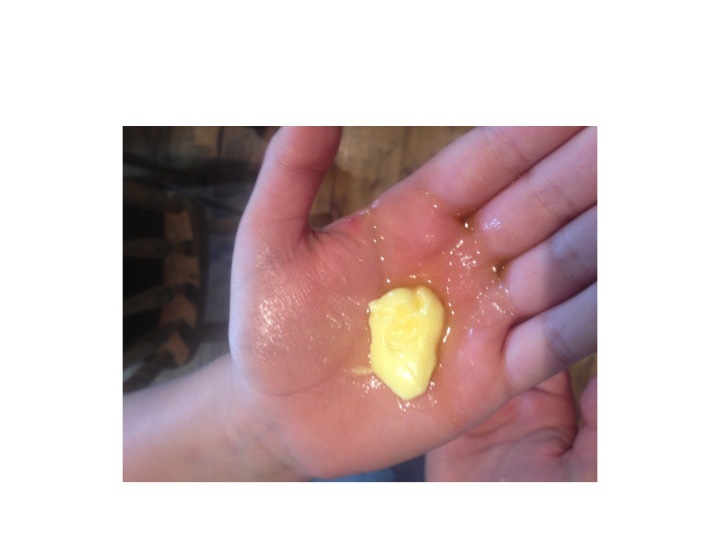 If you take a lump of butter and hold it in the palm of your hand it will melt. So, in the cow the fat is liquid. If you buy a fish and put it in the fridge, it will stay bendy, whereas a pork chop will go stiff. We all need to have liquid fat so we can easily move it around. Have a feel of that fat under your abdominal skin – it is liquid. That’s because it is 37 degrees Celcius. If it was at room temperature it would be at least semi-solid. One of the reasons that butter, or cow fat, is so saturated is because of the strange digestion system in cows. All the grass they eat goes first into an enormous biodigestor called the rumen. The rumen is huge. Over 200 litres – bigger than a person. Here cellulose is broken down by bacteria to simpler sugars. This fermented grass is then regurgitated back into the cow’s mouth, chewed some more, then sent down a different tube to other stomachs, ending up in the abomasum, which is similar to the human stomach when all the goodies in the grass are in a form which can be absorbed. The problem is that any unsaturated fat in the grass will be chemically reduced in the rumen to saturated fat. This fat goes to make milk and butter. The rumen of a cow is huge – it fills up much of the inside of the animal. 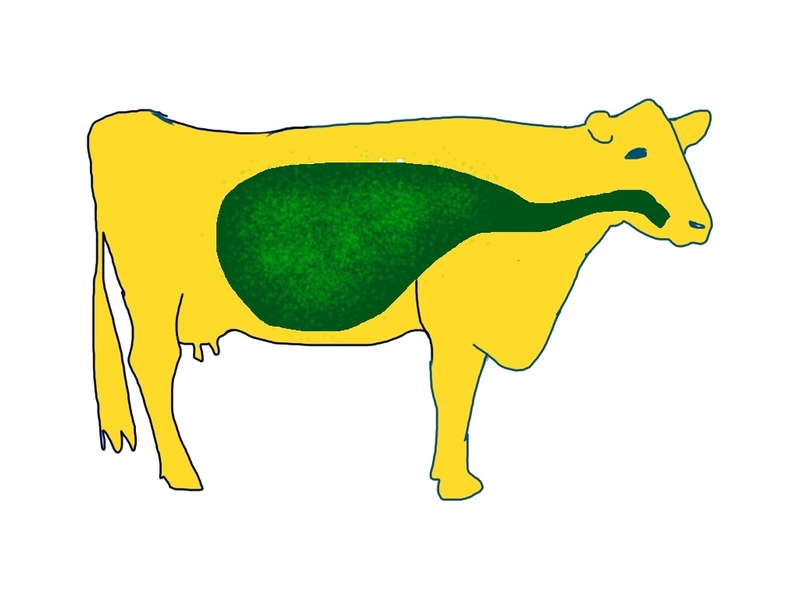 Unsaturated vegetable fats are reduced to saturated fats in the rumen. I must mention trans-fat here. Butter is relatively plentiful in Northern Europe, but has always been a quite expensive luxury. Napoleon offered a prize to anyone who could invent a cheaper substitute for butter. Margarine was originally made from beef fat, but it later developed as a way to make cheaper oils solid by reducing the C=C double bonds into simple C-C bonds by reaction with hydrogen and nickel catalyst. Hydrogenation of unsaturated vegetable fat to make it saturated will make it hard and good for making cakes and pastry. Unfortunately it can also cause the formation of C=C bonds in the trans- formation rather than the normal cis- formation. Trans- double bonds do not cause the lipid chain to be so bent. The straight chains are the reason that margarine is solid at room temperature. Napoleon never invaded England, he instead invented a fiendish foodstuff which over the years has probably killed a very large number of them. Trans fats are now banned in the US and most European countries. 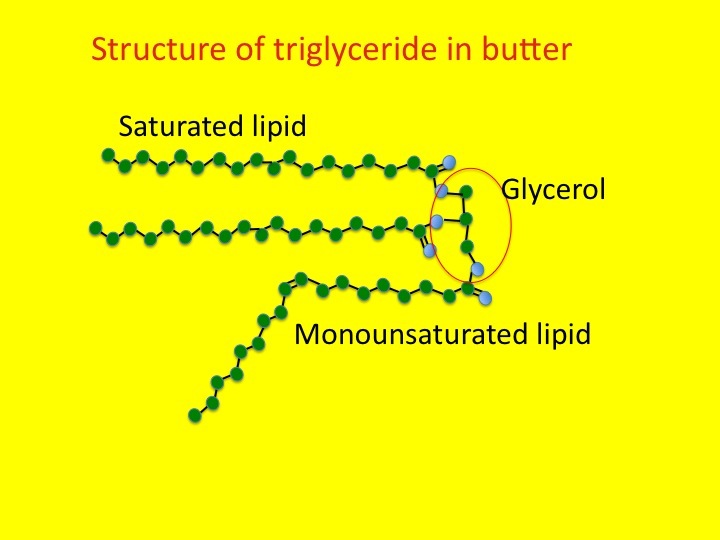 Margarine manufacturers have now devised other ways to make liquid fat solid without the formation of trans- fats. So why is saturated fat, and even more, trans- fat bad for us? Why does it cause coronary arteries to block up? The reason is that it increases the amount of cholesterol in our bodies, in particular the low density lipoprotein cholesterol – LDL. You might think that the reason why saturated and trans-fats increase LDL cholesterol is well known. Well, I read the book below and could not find the answer. Not online either. The following is my best guess. 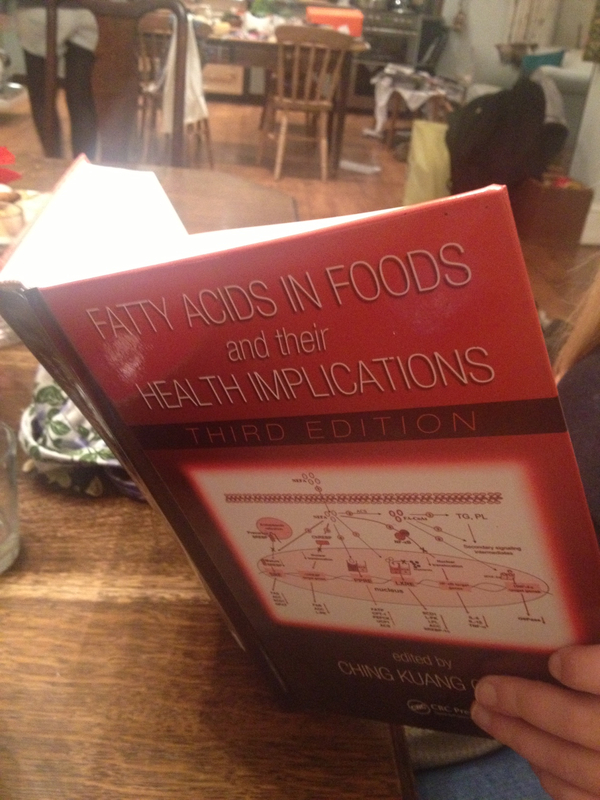 This book tells you almost all you need to know about fats. We have to take another aside here to talk about cholesterol. This is completely different from triglycerides. 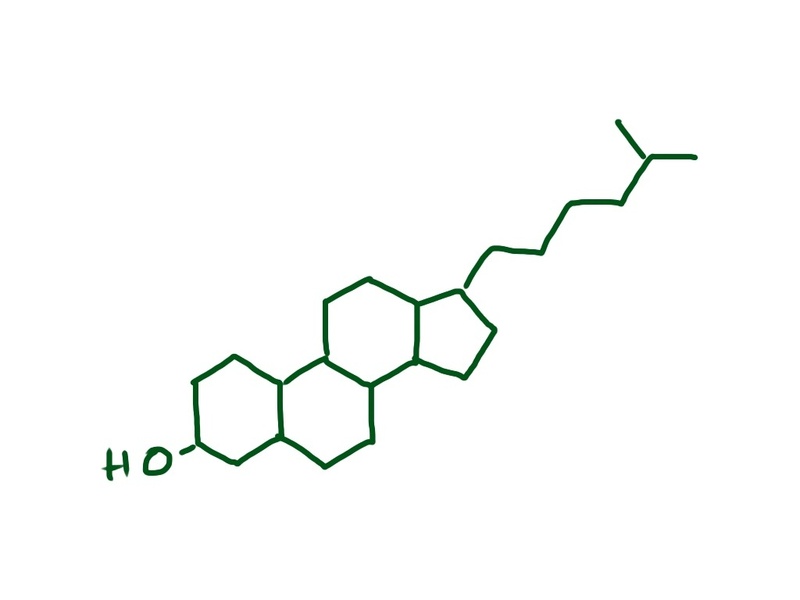 Cholesterol is an amazing molecule. It is only made by animals – vegans get no cholesterol in their diet, but luckily they can make it. I say luckily, because it is a totally vital substance which has many very important uses in our bodies. The one we are going to talk about here is its function as a constituent of cell membranes. All the cells in our bodies are surrounded by a membrane made of phospholipids – these molecules are similar to triglycerides but have just two fat chains attached to a phosphate group. Membranes made of just phospholipids do not do all the things we need a membrane to do. It will not be strong enough, rigid enough, and will be too leaky. Small molecules like sodium ions, water and glucose would be able to leak through and cells could not work at all. So cholesterol is used in large amounts to make the membrane stiffer and less leaky. 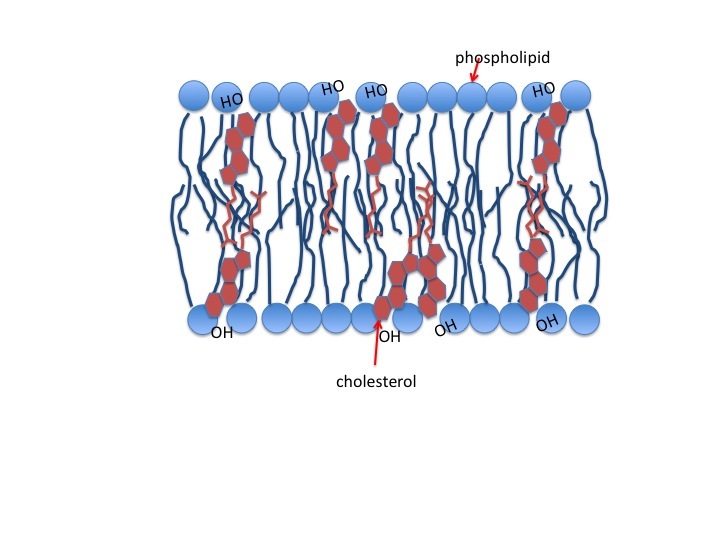 In many membranes there is as much cholesterol as phospholipid. All cells can make cholesterol, but it is a real pain. There are over 30 enzymatic steps needed to make cholesterol from glucose. An analogy might be clothes. We could all make our own clothes if we needed to – buy the cloth, cut it up and sew all the pieces together. But we’d rather buy them from a shop – much easier. Similarly for the average cell – it needs cholesterol to incorporate into its membranes – it could make it, but there is a ready supply in the bloodstream in the form of LDL cholesterol particles made by the liver – you don’t even have to order it – it is on tap all the time. The liver is good at a whole range of things, making cholesterol is one of them. It sends the cholesterol in little gift-wrapped packages, covered with a special protein coat, continually into the bloodstream to be picked up by cells around the body. 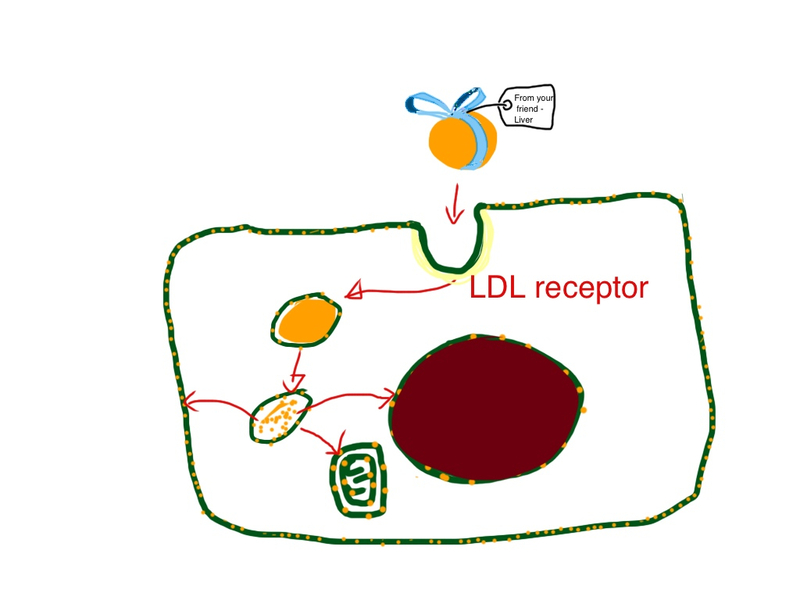 Cells which need cholesterol make a special “docking port” on their surface to trap the LDL particle, take it inside the cell and use the cholesterol to beef up and stiffen up its membranes. These docking ports are called LDL receptors. Seems like a good system. The problem is that when we eat too much saturated, hard fat, or trans- fat, these straight lipid chains get incorporated into the cell membranes. Because the chains are straight, the membranes are more rigid and less leaky. The cells therefore don’t need so much cholesterol to make the cell membranes nice and stiff and work properly. So the liver is pumping out LDL cholesterol, and the cells don’t want it. It seems that the liver does not have a good system of knowing how much LDL is needed. It keeps making LDL cholesterol and it hangs around, like an unemployed teenager. Then it inevitably gets mixed up with the wrong company – oxidising agents. Oxidation (from enzymes such as myeloperoxidase – see previous post on phlegm and horseradish) changes the LDL particle in a bad way, and it inevitably gets picked up by the police (see previous blog on asthma). Here the police are macrophages. They, for some unknown reason take the delinquent LDL particles and imprison them in blood vessels, just below the lining cells or endothelium. With time (Toby has been eating pies and cookies with enthusiasm for more than 50 years) these bad cholesterol prisons become fill up with inmates. They make a lump on the inside of the artery. The lump slowly gets bigger and bigger, making the hole down the middle of the artery smaller and smaller. When Toby woke up at 4am with chest pain, the surface of the lump, or atheromatous plaque to give its proper name, ruptured. Blood flow to part of his heart was cut off by platelets trying to mend a hole which was not really there. When a blood vessel is damaged, it is normally vital to plug up the hole. The first defence against bleeding to death from a hole in your blood vessel are platelets. These are tiny little bags made from bits of cells in the bone marrow called megakaryocyes. Platelets continually bud off from megakaryocytes and are packed with all the technology needed to find and mend holes in blood vessels. They have no nuclei, so are really not cells, more like pre-programmed drones which cruise round the bloodstream looking for holes. 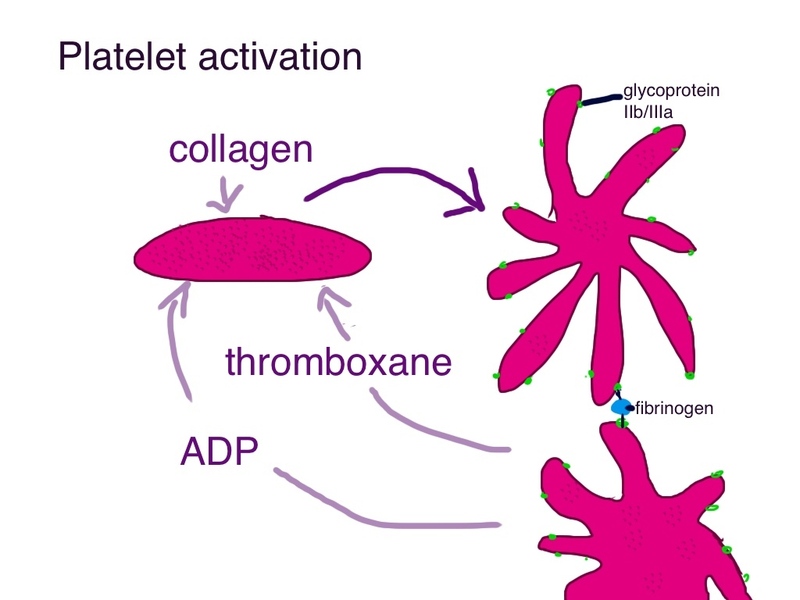 When platelets encounter collagen they activate and change shape. They stick together with the sticky glycoprotein IIb/IIIa. Activated platelets release thromboxane and ADP to tell nearby unactivated platelets to come and join the party. Thromboxane is made from the cell membrane phospholipids of platelets, from a very unsaturated fat called arachadonic acid. The enzyme which makes thromboxane from arachadonic acid is called cyclo-oxygenase. The reason why the ambulance crew asked Toby to chew two aspirins is because this drug very effectively inhibits cyclooxygenase enzyme and prevents platelet activation by preventing thromboxane production. He was given clopidogrel when he arrived in ED. This prevents platelets from responding to ADP released from their colleagues by blocking the ADP receptor. So the problem was that the atheromatous plaque, or fatty lump in his coronary artery had ruptured. This activated the platelet drones which were zooming by. Collagen is found in the wall of blood vessels, but is covered by endothelial cells, the cells lining blood vessels. When the plaque ruptures, as well as a soup of cholesterol and macrophages, there is a lot of collagen. The platelets go crazy – a feeding frenzy fuelled by massive release of thromboxane and ADP. Before long the whole coronary artery is full of activated platelets. If this happens in a large coronary artery the result is a STEMI: full thickness cardiac damage. Toby was lucky, his clot only caused partial thickness damage, but was still very painful and will mean that his heart will not work quite as well as it did. Why are trans-fats worse than ordinary saturated fats? I don’t think there is a definite cause known, but it may be simply that once the straight trans- fat is incorporated into cell membranes it is more difficult for the normal metabolic process to add further cis- double bonds and elongate the lipid chain into a bent and more liquid form. This means that cells need even less cholesterol to make their membranes stiffer, and LDL cholesterol is even more redundant and superfluous to requirements. We have understood about unstable atheromatous plaques only relatively recently. A really important contribution to our understanding was made by Michael Davies who died in 2003. There is a short and very understandable youtube video showing him dissecting a coronary artery from a patient who died from a STEMI. The clot in the coronary artery in the video is made of white thrombus – basically activated platelets sticking together, with a mission to save lives but causing death. Drones can be problematic. Michael Davies discovered why about 15% of people in the US and UK die. He has not even got a Wikipaedia page and there are no photos of him on Google images– can someone sort this? I mentioned that fish is good to prevent heart disease. The Japanese eat lots of it. I have started to eat more fish. Fish oil has an extra double bond near the end of the lipid chain – 3 bonds from the end – omega 3. (Omega is the letter at the end of the Greek alphabet, so if we are counting bonds from the end of the lipid chain the omega notation is used). Now if we eat fish, the lipid chains in our membranes have an extra cis- double bond near the end. When our platelets use these lipids to make thromboxane, a slightly defective form is produced with the extra double bond. This is known as TXA3 rather than the normal TXA2. TXA3 does not work as well as TXA2 and platelets cannot stick together so fast. This is a good thing if you have a ruptured atheromatous plaque in your coronary artery. Now the food link – dodgy lasagne. Horses do not have a rumen. They eat and digest vegetable matter in a different way from ruminants like cows and sheep. They first take out the goodness they can in a normal stomach, then ferment the residue in a huge caecum, which breaks down the cellulose into simpler, digestible molecules. They are known as hindgut fermenters. This means that the vegetable lipids are absorbed in the stomach and stay unsaturated and horse meat contains fat which is much healthier than cow or sheep fat. Ironically (given the recent scandal about horsemeat in lasagne), horsemeat is therefore better for us than beef. *They don’t really have a choice. So, if trans-fats are now banned, is margarine still worse for us than butter? And why do you tell us not to eat palm oil? Also, chronic spelling mistake – Wikipedia is spelled differently to Enclyclopaedia Brittanica – no a.
Margarine no longer contains trans fat but is it worse for us than butter? – I don’t think we know. Also don’t know whether palm oil is harmful. We do know that saturated fats like palm oil and butter increase the bad LDL cholesterol. If we eat unsaturated margarine there cholesterol does not go up but some think that the omega 6 will increase the likelihood of producing arachidonic acid products like thromboxane. Best advice is to eat lots of fish and vegetables, and not too much other fats, apart from perhaps olive oil which has no omega 6 and is not saturated. Fish, vegetables and olive oil is the basis of a mediterranean diet.